He is Georgia's richest man and his followers have just ousted President Mikheil Saakashvili's ruling party from power in a shock election result, so what else do we know of Bidzina Ivanishvili? He owns a private zoo stocked with zebras and flamingoes and has one of the world's most valuable art collections. He lives in a futuristic steel mansion, with a helipad and fake waterfall, that looks like a James Bond film-set. But in the action-packed movie of Georgian politics, it is not yet quite clear whether Mr Ivanishvili is the hero or the baddy. "I have come into politics to save my country," he told the BBC during an interview in his palatial Tbilisi headquarters, as he gave an impromptu tour of his $1.3bn (£800m) art collection. He owns works by Roy Lichtenstein, Jeff Koons and Damien Hirst - one of whose pieces he commissioned specially for a particular wall. In 2006 he bought Picasso's Dora Maar with Cat for almost $100m - at the time the highest amount paid by anyone at auction. For the 153rd richest person on the planet, it was a bargain. But in person he is not quite as flamboyant as all this suggests. Softly spoken and polite, he is not what you would expect from a person who has ousted Georgia's powerful ruling party and inspired feelings of fanatical devotion and distrust in equal measure. Before the first interview he gave the BBC in 2011, just after he had announced his political ambitions in October, he seemed nervous. And he confessed he did not know how to stand in front of the camera. Since then, he has repeatedly said he is not interested in, nor does he fully understand, politics. And he has said on several occasions he wants to only serve as prime minister for two years before leaving politics for good. This apparent honesty has charmed many Georgian voters who often distrust politicians. They see him as one of them. He may be much richer but he started off dirt-poor, running round without shoes in a village in rural Western Georgia. Very different, some voters feel, to President Saakashvili's all-powerful political elite, which is a close team of pro-Western and culturally liberal urbanites in their thirties or forties. They go down well in Washington and Brussels but they think very differently to many ordinary Georgians, who have strong traditional family values and a high regard for the culturally conservative Orthodox Church. And after almost a decade of unopposed power, President Saakashvili's party is often seen as arrogant and out of touch. 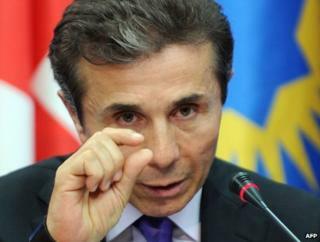 But while Mr Ivanishvili's statements seem genuine and honest to some, to others they are extremely worrying. This will be the first time he has held political office and there are doubts whether he is experienced enough to control a coalition, made up disparate parties with conflicting ideologies. There are controversial figures within his Georgian Dream coalition. Some of them are accused of having links to the crime and corruption of Georgia's past while others have made xenophobic, nationalistic or homophobic comments, unchecked by Mr Ivanishvili. And his plan to serve as prime minster for just two years comes across as dilettantism - a particular concern in a country which over the last 20 years has been torn apart by civil war, revolution and political strife. Mr Ivanishvili may have successfully built up and run a $6.4bn business empire but this was in the chaotic and corrupt days of 1990s Russia, his critics say. Not exactly a model for political transparency and democratic accountability. And with a lot of the election campaign devoted to allegations and counter-allegations of dirty tricks from both sides, there are few concrete policies. Mr Ivanishvili's platform seems to consist of using his own money or foreign investment to boost the economy but the actual details remain vague. He is often accused of being inconsistent and coming out with conflicting statements.